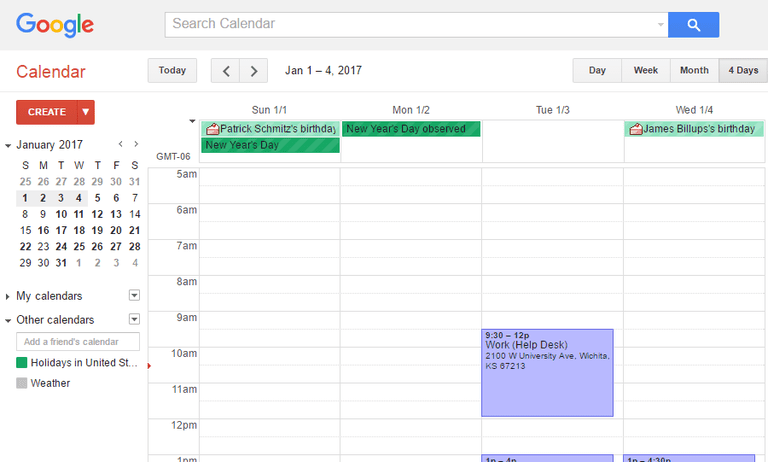 Google Calendar is an impressive free online calendar that lets you easily keep track of your events and share the calendar with your family, friends, or co-workers. In addition to the calendar, you can use Google Calendar to set up reminders and send invitations, as well as keep track of RSVPs. One of the main advantages of using the Google Calendar is that it's just so easy to share. I personally use Google Calendar and I share it with my husband where we keep track of meetings, appointments, birthdays, and whatever else we need to put on there. Google Calendar can easily be accessed and updated by whoever has permission to access your calendar. You can have multiple calendars and you can share none, some, or all of them. This is really helpful if you would like to have a personal calendar but also a work or family calendar that's shared with others. You can share a calendar by going into the settings and deciding to make it public or to share it with specific people by entering their email address. If you do make the calendar public, you can share the ICS file for the calendar as well as get an HTML link that lets others see your calendar right in their web browser. You don't need a manual to get started with Google Calendar, just click on a day and start typing to add events. You can view the calendar by day, week, or month depending on your preference, and all views are easy to use. There's also a way to view your calendars by just four days at once and as an agenda, which is just a list of all the upcoming events. I love Google Calendar. When it comes down to it, this is the online calendar I choose to use. It may not be the flashiest or have the most bells and whistles, but it's the easiest to use and most reliable online calendar that I've come across.